I don't really have a loft - just two of the three bedrooms on the upstairs floor that I've re-purposed as studio space. The smaller room (I have designated as Studio A) houses my sewing machine, fabrics, yarn, knitting and quilting supplies and PiPs (projects in progress) and books/magazines on quilting and knitting. 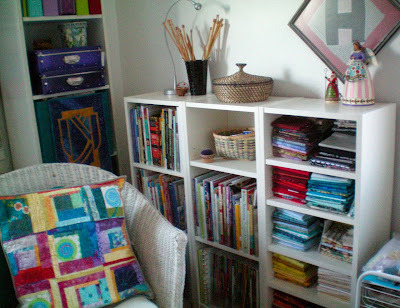 Plus, there is a wicker chair that I use for knitting and reading or just for a little quiet. Three of the walls are covered with design boards - foam core boards covered with flannel. Great display space! There is a lot packed into this 72 square foot room. Studio B is the larger space, approximately 10' x 12'. My computer, printer, files, more bookshelves and work space line two of the four walls...the other two walls house furniture for papers, stamping, paint, ink supplies and other paraphernalia: tools; more PiPs, rolling carts, etc. 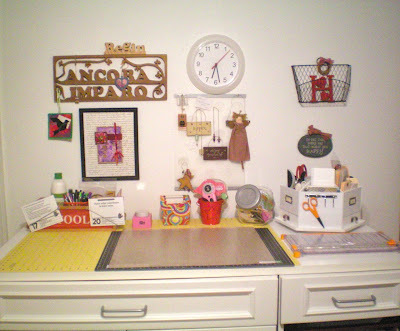 I have a book shelf and two cabinets that are counter height; both serve as work space and provide storage. Like The Queen's Ink (I think they probably rearrange furniture and displays every 6-8 weeks; it's a good thing they're not in Ohio! ), I find that a periodic rearrangement/moving of things within my studios presents me with the opportunity to reunite with an abandoned/forgotten project or supply or tool and re-inspires me. I have all the issues of Studios, I think that maybe I'll revisit them again for the first time... if you are unfamiliar with the publication, on your next visit to The Queen's Ink, check it out. They have the current and several of the previous issues, for sale, still. P.S. from Lolly: We are receiving phone calls and emails inquiring about T!m Holtz workshops, ever since he announced on his website that he was planning a visit to The Queen's Ink. T!m is a busy guy; that said, we don't know what he's teaching and likely will not know for another month or so. We plan to announce the classes with descriptions, times, and prices sometime in June, at which time we will tell you when registration will begin. Please make sure you're on our email list so you'll be alerted when the classes are listed on queensink.com.